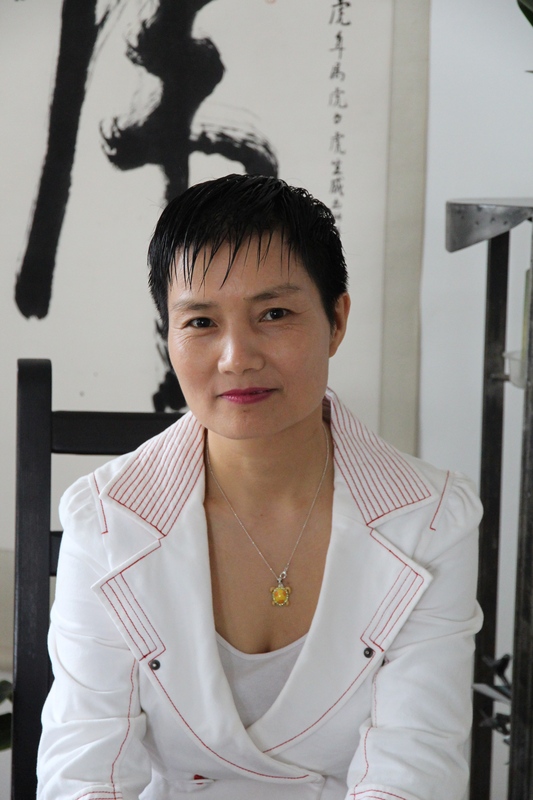 Sally Li Mai is a massage therapist and a tai chi master. I was born in 1968 in Taishan, a small city in Guangdong province in southern China. My sister Na came here first in 1986. She became a citizen in 1991. My parents came in 1992, and they, too, became citizens. On April 3, 2003, I came here. I’d had to wait nine years longer for a visa. My other sister and two brothers came at the same time. It’s not easy to come to America, it’s really hard. My parents wanted us all to come, but it took a long time. My parents and sister now live two blocks away from each other in Northeast Philadelphia. When I heard I passed the visa application I was so excited I was crying. I’d dreamed of coming to America since I was three years old. I missed my family who were here already. I didn’t want to stay in China. Two days after I got my visa, I left. I landed in New York at Kennedy airport. My sister and friend came to pick me up. New York was so beautiful. Wow. I was so excited. I thought, “I am free!” I came to America. I felt like a bird in a cage set free. In China, my then husband and I owned a successful company selling home improvement supplies, and I was a tai chi master. When I came here I worked in a factory and lived in my parents’ house, sharing a bedroom with my sister. Then I left the factory to work at Dunkin Donuts for four years. That’s where I started to learn English. When I first got married in China, I was so unhappy. My first husband’s family was not nice to me. But I moved back to marry him, so my son could come here. I needed my husband to bring my son. I did not want to stay married but I sponsored them both to come here. My son was twelve when he came to America. He lives with his dad. Before we got married, we fell in love, but then he hit me. He kept secrets from me. I hated him and his family. I called my mom. She said bring him and come to America. I would do anything for my son. He was born in 1996. After I came to America in 2003, every year I stayed one month in China to be with my son. My son and husband lived in his parent’s house. I didn’t want my son to forget about me. After they came to America, my husband and son lived with my parents for one year and then moved out. We got a divorce. He tells my son your mother is not good woman, not good mother. My son listened to him more than me. They were lucky that I brought them here. I am so guilty I did not tell my son the whole story. They came in 2008. When we got divorced, we agreed to share custody. But then my husband hired a lawyer to go to family court. I worked at Dunkin Donuts and had little money. We shared custody but I had to pay child support to him. When my parents first came here, my mom and dad were in their sixties, and worked sewing in a factory in Chinatown. My dad, in China, had a good business. He was the president of a chemical factory, in the city of Guangzhou. My mom thought they would work two years here and then retire. Mom got me the factory job. I cried every day the first year I came here. I told my mom I wanted to go back, I didn’t want to stay here. It was such a hard life. I stood up working twelve hours a day, working Friday, Saturday, Sunday. I went to school to learn English Monday through Thursday. I got up at 4:30 to work from 6:30 AM to 7:30 PM for a year. After a year, I traded my factory job to go work at Dunkin Donuts. I worked at 15th and Chestnut for four years and met all kinds of people. I had never seen black people before. I quit Dunkin Donuts in 2008. I got a license as a massage therapist and started my own business. I had studied traditional Chinese medicine massage in China. When I first came here, in Northeast Philadelphia, I did tai chi in my parents’ front yard. My sister and parents told me not to do this outside. They wanted to fit in and seem American. My neighbors liked tai chi and wanted me to teach them, but my sister was afraid and told me not to take any money. I do not see my son and that makes me very sad. I can see him only every two weeks. I hope when he goes to college and moves out of his father’s house, we will be closer. When my son was born, I was very weak and sick. When I took my son to kindergarten I went to the park to exercise because my doctor told me to. I met my tai chi master and learned tai chi and began to feel much better. Tai chi saved my life and keeps me in good health. I met Steve when I worked at Dunkin Donuts. He was nice and very patient. He would spell words for me so I could look them up. In China, I had lots of friends and no one had the same birthday. But Steve and I had the same birthday. I fell in love with him. Steve invited me to his art show. I didn’t know what it was. I had to translate the invitation and then I knew he was an artist, a sculptor. The first time they met Steve, my family said no because he is older than me. But now they know we are happy. Then on July 27 for my birthday my whole family went to dinner in Chinatown. I invited him to come to the party. Nobody spoke English but he came, and it was both of our birthdays. Then Steve invited me to the art museum. That’s my love story in America. In 2010 I became a citizen. I had to learn American history to take a test. I’m happy here in America.